Hi, I am Nathalie and I want to plant happiness. Nine month ago, my spine told me to take a break from my work as an illustrator and author. But in reality it was my soul that was crying for a break. My soul wanted to have time to focus on what’s most important: happiness. And how to grow it. Maybe I am just lucky with the people surrounding me. Because whoever I spoke to during the last months (friends, neighbours, colleagues), they all long for a happier world. Not only for themselves but for all people. But I don’t really think that my circle of friends is special here. All humans are social and empathic by birth. And we can only be happy when we do what feels right. When we do what our heart tells us to do. Small children still have an intuitive contact to their feelings. They listen to their heart and act on it. This intuition does not vanish when we grow older. But we tend to forget to listen to it. We tend to forget how important this part of us is. We push it aside or into the subconscious parts of our mind. Because we are so used to function, to go on with the program, to focus on the tasks on our to-do lists. But what task could be more important than happiness? None! And I am sure that’s what my spine wanted to tell me. That I no longer felt ok with going on. That I no longer felt ok with following the program and playing the “game” that causes so much unhappiness in the world. I no longer wanted to push my empathic being to the sidelines. I no longer wanted to tell it to be patient and wait. My whole organism seemed to cry: “I don’t want to focus on the side issues, the irrelevant points on my agenda. I want to concentrate on the one thing that is really important: happiness”. But how do we do the happy thing? 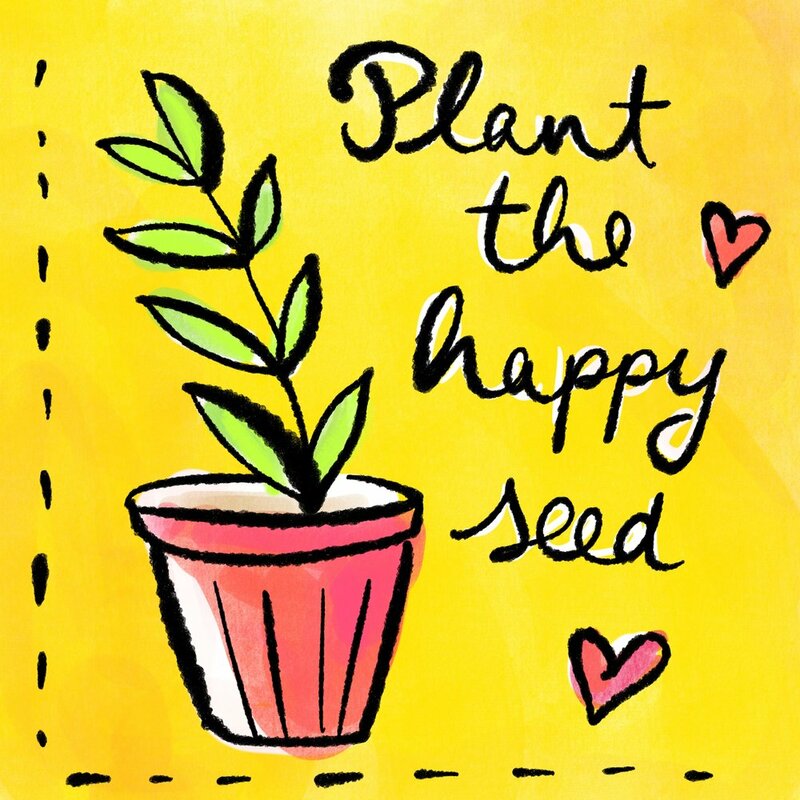 How can we plant the happy seed and grow happiness? What does happiness need to bloom and spread? I am still at the beginning of my search, but I already know one thing for sure: Happiness starts in our heads. And it only spreads when we give it space and attention. Gardeners prepare the ground, plant the seeds, water the seedlings and lovingly care for them. We need to do the same with happiness. It needs our loving attention. We need to help the happy seeds to grow to healthy plants. We need to take care that our happy thoughts are not overgrown and overshadowed by other thoughts. Because that is exactly what happens: Our happy thoughts are being overgrown by other thoughts. Those other thoughts seem to be more urgent or more realistic. More grown up or more normal. But in reality these thoughts hurt us. They keep us from doing the happy thing. They prevent us from following the happy path. And they tell us that our happy visions are not possible, not realistic. And when I learned one thing during the last months, it is this: More and more people all around the globe say no to the game. More and more people are taking to the road. They no longer allow themselves to be distracted. They plead to focus on a happier planet. We are many. And there are so many good things happening. We have all the solutions we need to solve the problems. There are millions of initiatives and actions. We just must not allow ourselves to be distracted. We must stop to just go on with the game. We must start to think real happiness and do the happy thing. Yes: do it! Happiness is a verb. It happens when we do it. When we lay out happiness gardens. In our heads and on the streets. In offices and malls, in schools and on rooftops. Let’s become happy gardeners. Let’s grow happiness everywhere. Here on happygrowshere.com I challenge myself to keep a journal on happiness. So that I can discover my personal happy wisdom. This will help me stay on track. I also will join in on community actions and talk with happy activists. Let’s learn together! Join in and start your own happy journal. Discover how much you already know about happiness and how to grow it. Talk to people about happiness and let yourself be amazed of all the wisdom that is singing in the air.